A mortar boost to Howitzer Bridge currently being tested. Some feel the map could use a bit of deterrent to the early bridge rush. Others feel that the scenario has grown a bit dry since the ballistic artillery were toned down. 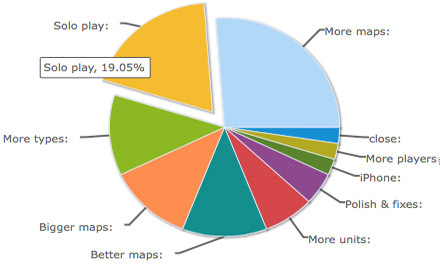 Still the map is one of the top favourites for some people and we need to get it right. So currently we are testing to see how a well placed mortar unit can jazz up this battle. So far it seems to add more tension to the conflict and also help with beachheads. Gore piles made by mortars also enhance the long range howitzers with extra damage and morale hits. It seems like a good change so far. Waves of fresh troops arriving. 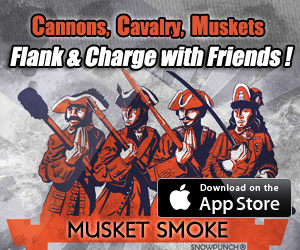 The emergence of a new app store feature called ‘App Bundles’ forced me to tinker with the price of Musket Smoke. Only paid apps can be in a bundle. This experiment was mildly successful but we saw quite a drop in new players. Now that the experiment is over the shift from being a paid app to a free app has also been caught by a number of automated web sites and thus we have a recent spike in new users. It will probably take a week or so for them to get through the solo training area and then the ‘new player zone’. Those that survive should help invigorate the Musket Smoke community with a fresh batch of new blood (and gore). I’m also gearing up to boost Musket Smoke II development with a Kickstarter. The side effect of that effort might also produce a second wave of fresh troops for Musket Smoke Classic. If that’s not enough on the recruitment front for you then take matters into your own hands and post an app store review or mention Musket Smoke online somewhere. I know the cause here is not as nobel as say ‘fighting for democracy’ but I do seriously believe Musket Smoke stands out as a significant new direction for tactical wargaming. This game IS worth fighting for as it stands in stark contrast to a multitude of other games that don’t offer intelligent tactical options or creative tactical freedom. It is actually very hard to offer enormous tactical depth but keep the UI simple. Mention “Musket Smoke” in online social media. Start more matches, and play more often. Try to move up in the leaderboards. Be friendly to new players. Help train them and turn them into worthy opponents that stick around. Share your battle stories or tactical videos. We all enjoy to learn from other peoples battles. Help me focus on what’s good and what’s not. Send feedback on what you think is the best and worst of Musket Smoke. Volunteer for Musket Smoke II alpha-testing. (You play vs other testers and help suggest tactical adjustments). One thing is for sure. You will not see a lot of developers following in my wake if this ship sinks. I’m doing my part in this ‘mobile tactical revolution’ – the rest is up to you. New players also have a voice. The last pie results (in a previous post) show mostly what the vets want. That is, improved multi-player. However, as ‘new player’ votes gradually trickle in each day – the pie is slowly changing. The votes for Solo Play is growing. This is to be expected as new players have less desire to fight other people mainly due to a lack of experience. They want more solo play to help train. As the developer I hate to see new player retention rates fall so I am heartened by these results as I work on Musket Smoke II. A grand Solo Play experience is the highlight of Musket Smoke II, yet the game also enhances the online Multiplayer experience on all the fronts you see here in the pie. In the meantime, I recommend new players heed the advice in a previous post. Your first few matches will likely be with players of your same level and will be much more enjoyable than the solo training. Tactical skills learned in Musket Smoke will transfer over to Musket Smoke II. So investing time in Musket Smoke Classic will definitely kick start your future conquests. The Commanders have spoken. More maps. Edit: updated Oct 5, 2014. The survey was mostly to make sure that I’m on track with Musket Smoke II. However, it also can influence updates to Musket Smoke Classic. Musket Smoke II is focused heavily upon a Solo Campaign, but it also has a great Online Battles section with more maps, more unit types, better maps, bigger maps and more units. I was a little surprised there wasn’t more demand for iPhone (universal), but that’s probably because the survey was done on an iPad. Regardless, I think Musket Smoke II is definitely on the right track.